I enter the race at my own risk and will not take part unless I am medically fit to run a half marathon within 3 hours and 30 minutes. I accept that should I not make the average pace of a 3hr 30min Half Marathon, that at any time during the event, the organisers can remove me from the course as roads will have to be reopened. The average time of 3.5hours will be from the last person crossing the start line. The Organisers will allow 10 minutes for all competitors to cross the start line from the starting horn. To the extent permitted by the Unfair Contract Terms Act neither the event organisers or associated parties will be liable for any loss, damage, illness or injury resulting from negligence in consequence of my participation in this race. The organisers reserve the right to refuse or cancel applications, to alter the date of the event, the course route or distance. No refund can be given if the race has to be foreshortened or postponed or due to circumstances outside the organisers control. In the event that the race has to be cancelled by the organisers due to circumstances outside their control entry fees will be refunded where possible, but damages in any claim for costs in relation to cancellation will be limited to refund of entry fees. 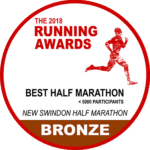 Swindon Half marathon entrants must be 17 years or older on race date. I agree to abide by the Race Rules, UK Athletics Rules of Competition and to obey Police, officials and marshals instructions. I understand that wheeled, self-propelled vehicles, cycles, roller skates and dogs are not permitted at this event for safety reasons. All entries must remain personal to the entrant, and can not be used by anybody else, or sold on behalf of the entrant. Any athlete found to be running under a different entrants race number can be removed from the course. By opting to register as an affiliated athlete listed under the UK Athletics as affiliated to the declared club, you give the right for the organisers and UKA to check on membership. Competitors found to have entered as an affiliated athlete, but not having an active membership, will be asked to pay the cost difference on entry (£2), plus an admin fee of £5. The race organisers and associated parties reserve the right to use photographs and images of all runners. After 01/07/19 No refunds are available. Refunds are subject to the deduction of a 4% card handling fee imposed by the entry system. Your expressed view I believe is indicative lasix 60 mg of what is..